I love YA fantasies about young girls finding their power, but I’m a bit overwhelmed specifically by the ‘women are super oppressed because men find them dangerous’ trope that keeps popping up. 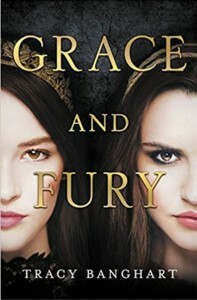 Grace and Fury was absolutely fine as a YA fantasy (no magic!) and OK kind of novel really. The best thing about it was that because it followed two sisters, it could intertwine two completely different stories: one the rags to riches tale of the oppressed girl thrown into a life of glittering privilege, and one about the privileged girl losing everything she’d worked for and forced to survive on an brutal island prison. This worked really well because, coupled with cliffhanger chapter endings, there was almost never a dull moment and it made it easy to flip the pages and consume. However, there was something about the characterisation that seemed really… I don’t know… shallow? I couldn’t tell you anything about the characters except that one was sad and guilty about her circumstances and the other was angry and guilty. I have no idea how they really felt about anything. The romances for both of them were really sudden, and I hate to say it, instalove: but not in the usual way! The girls didn’t lay eyes on their beaus and instantly fall in love, no; it was more like ‘no mention of developing feelings whatsoever, then suddenly making out.’ Like… we didn’t really get to see into their heads beyond the first layer of their emotional state of being sad or angry (or scared). Nothing developed, it just happened, like flipping a switch. My biggest problem though, was the actual inciting incident that split the sisters apart. If all women are deliberately forbidden to learn to read, why did ANYONE assume Serina was reading, even if she was holding the book? And even if they did suspect she could read, why was no one else punished? Why did they not try to find the person who ‘taught’ her? And finally, if they REALLY thought she could read, why didn’t anyone TEST HER? Once I got over my major issue with the plot, I actually enjoyed it in places! The description of the food and clothes were nice. There were a couple of interesting twists that you’ll probably be able to guess but it’s nice to have them confirmed. It was really great to see Serina’s characterisation grow from this plus-size pretty pampered thing to a scrappy survivor forced to kill, although Nomi was much more annoying if only because she was so freaking mouthy all the time and no one really seemed to care. It’s not brave or spunky to be rude to royalty, it’s stupid, and it annoyed me. Overall, if you skip this one I don’t think you’re missing much, because it’s nothing we’ve not seen before. However, if you’ve not read much YA fantasy, you might really enjoy this and the story it is setting up for Book #2. I received a copy of this book from Netgalley in exchange for an honest review. This does not affect my opinion of the book or the content of my review.